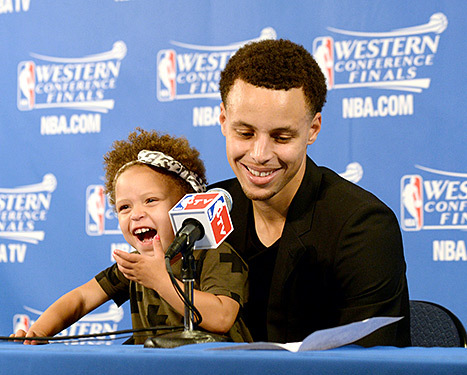 The media went crazy Tuesday night when Steph Curry brought his daughter Riley onto the podium during his post-game interview. And by crazy, I mean overreacting to a two year old livening up what would have otherwise been a boring interview that we have all seen countless times before. The major complaints from a few uptight sportswriters was that adorable Riley took away from the integrity of the post-game interview, causing distractions after an MVP caliber type performance from the overlooked and then scrawny kid who played for Davidson back in 2008. I saw the whole interview take place live, and not only did Steph Curry continue to answer questions, but he did so while keeping the corner of his eye on Riley to ensure she didn’t fall off the stage when she went under the skirt of the table to wave hi to the folks in the media. Derrick Rose, Tim Duncan, Chris Paul, and many other NBA players have brought their kids to the press conference after games. Although I don’t recall any of their kids going under the table and laughing and yawning during the interview, there is obviously no rule that states players aren’t allowed to bring their kids to the microphone. But what caught my attention the most wasn’t that these sexually frustrated sportswriters were so uptight about what happened. I do understand they had deadlines to meet and that Riley was a bit exploratory in the interview room. What bothers me is the fact that we, as a society, have totally lost our ability to appreciate moments like the one from the other night. An unscripted, unplanned event, unfolding in front of millions of television sets across America, featuring one of the hottest families in major sports today. Coming off an MVP season, in the midst of the Western Conference Finals in the NBA, Steph Curry is about to become a father for the second time as his wife Ayesha is far along into her pregnancy. Curry has shown nothing but humility throughout his professional career thus far, striving with dedication and passion to show the world his perfected craft of shooting, which also helps elevate his teammates level of play to the point where they dominated the regular season and the playoffs so far. Then we add the adorable aspect of a toddler who is two and a half, exuding curiosity and showing us our continuous common humanity. She reminded us of what is really important at the end of the day. Win or lose, as a player or as a fan, we always have our loved ones and cherished people in our lives that make it all worthwhile. She shed light into areas of the Curry family that are usually unavailable for the public to see. If those members of the media who complained were a bit looser with their sphincters, they would have seen that the story being revealed was perhaps a rare sight to see, and they would have treasured it more. But instead, they were too busy feeling like their needs weren’t being met: they didn’t get the predictable cliché answers offered by every star athlete after games. Riley spiced up the interview in unprecedented ways, creating all sorts of photo opportunities and quotes for the media to feast on, yet these select few sports journalists had such tight sphincters that they had to soothe their egos from the break in routine by hiding behind and over-exaggerating the importance of their roles as medial folk. Are we that disconnected from the tenderness and playfulness of childhood that we look down and preach about the little negativity or distraction, if any, that transpired during the interview? Me? I think there was a key lesson here for the sportswriters who were uptight and complaining. We don’t always get what we want, and instead of complaining when we don’t and throwing tantrums, perhaps there are nuggets in those unexpected moments where we can extract a different story and leave with gems we didn’t expect to come across in the first place.